I think we might have to pencil in the question of induction heating of asteroids as well. The young Sun can do that but I've no idea about f type stars, do they, f types, switch off that evolutionary phase earlier, or later? (Mass of planet + trojans) <~4% mass of star. Yes 1/28 it was I think . 4% gives for Jupiter sized planets about 40 bodies. Anxious to see such a simulation . I performed some simulations having some Jupiter sized planets around our sun in a coorbital orbit at 5.2 AU , meaning several Jupiters in the same orbit , but separated by fi. 60° in their orbit . To my surprise I don't get stable orbits with a lot of Jupiters , except for the case in which I put an extra Jupiter in the L4 and the L5 lagrangian point , thus creating trojans the mass of Jupiter itself . Regarding ~4%, I found better numbers. If the combined mass of the planet and its trojans is between 0 and 2.85%, the system will be stable. If the combined mass of the planet and its trojans is between 2.85% and 3%, the system will not be stable. If the combined mass of the planet and its trojans is between 3.1% and 4% the system will be stable. If the combined mass of the planet and its trojans is greater than 4% the system will be unstable. This is from a discussion I had 8 years ago on the Cosmoquest forum. I suppose we can simply wait for SETI's announcement, which they say is forthcoming (six weeks). Though they do seem to like a lot of showmanship, and they might be announcing that they couldn't hear any radio alien chat. They wouldn't have anyway, it's too far away, and it would be tight beam. So, pointing a radio array at the star is to look at its radio spectrum, and thy must be looking closely at it in the optical as well. The very fact that it doesn't have any close in gas giants, yet the star has lost angular momentum, has to mean it's going to be a major press conference when it comes. I had hoped that that guy Anders Sandberg, might have joined here, as he does seem to know his stuff. Early days,he miht just be slow at reading his blog replies.
. The very fact that it doesn't have any close in gas giants, yet the star has lost angular momentum, has to mean it's going to be a major press conference when it comes. Not sure what you mean by the statement about the gas giant . Didn't know the star lost angular momentum . Do you have a reference ? 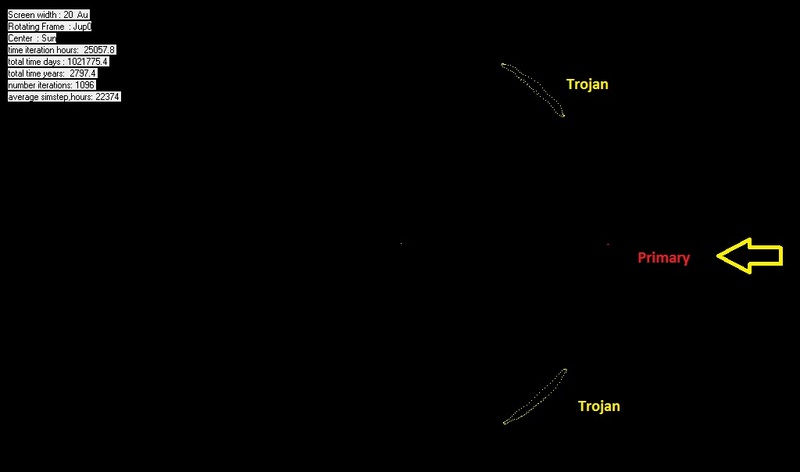 Suppose the light curve of the planet is due to a transit of major Jovian Planet , followed by some Trojans , as depicted in the picture hereby . I "played" with some initial settings of the system ( coorbitals) and limited myself to a trailing and a leading Jovian planet of the same mass as the primary . In the setup the following system is stable : A Jovian planet at 5.2 AU , having 0.4% Solar mass ( NOT 4% !) , followed by a trojan of equal mass at 60° and behind a trojan of equal mass at 60° . So total mass of all bodies being 1.2% of the solar mass. Replace the trojans by some bunch of smaller bodies , and maybe we get the light curve observed ? It's rotation is about 27 times faster than Sol's. It hasn't dumped as much angular momentum into its planetary disk as our sun has but that's okay. A star in its collapse becomes unstable, it dumps about half its mass into the equatorial plane, and continues contracting. When it "switches on", it drives most of the light stuff out. With this star there's going to be more mass in the disk but not enough to brake the star's momentum as effectively as our solar system has. - two Jupiter planets , having each 5 MJup , at 6AU distance , sharing one orbit . - one of them has 7 Earth sized moons around it . The systeem seems to be stable . Edit : link above doesn't seem to work ; I'm pretty sure I posted it with the Save feature , also providing some description . Can't find the sim either in the list of simulations. You lost the .html when you copied it. I fixed it for you. It's in the list. Refresh your page. Thanks . I was worried not to see the sim in the list and configured the sim twice . Now I see I have to refresh my browser in order to see changes. Both are there . You can delete one of them if you want.